The beauty and utility of a good quality floor lamp can’t be beaten for lifting an interior to a higher plane. Placing a floor lamp in the right place and using it in the right way will enhance your living space in the way planting a tree can enhance a garden. 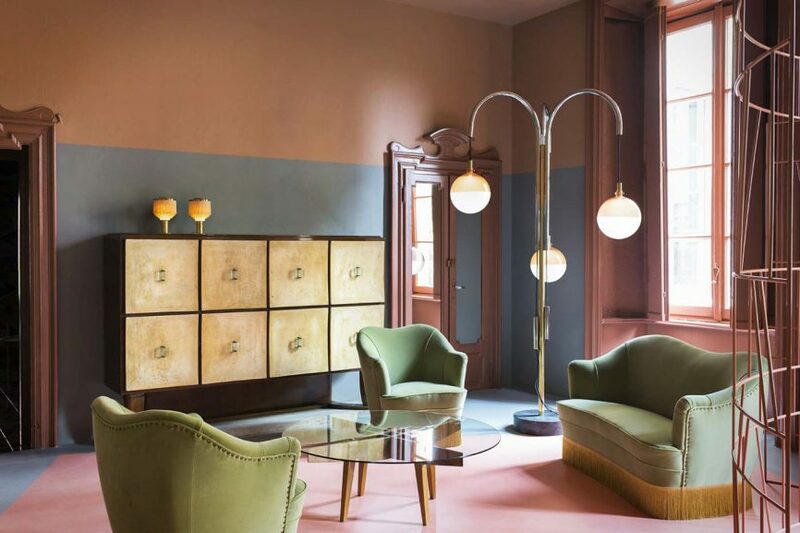 Dimore Studio are masters in the use of vintage lighting. In the image above, the floor lamp adds another dimension, emphasising the space above the furniture. In a room with very lofty ceilings, this floor lamp acts in an almost sheltering way to the furniture arrangement, giving the open space more intimacy. You can think of floor lamps as adding a middle storey. Instead of just the traditional layers of floor covering, furniture and overhead lighting, you can use floor lamps to give directional light from a position hovering just above the furniture arrangement. If they have curved arms, floor lamps can also add grace and elegance, giving form to empty space - notice the open area that flows under and around the arms of the lamp. This would simply have been empty but for the graceful three dimensional curves the lamp imprints on the scene. In terms of utility, the light from a floor lamp isn’t just about reading. If you have high ceilings, floor lamps are a great way to introduce focussed light to seating and tables, floors and areas of foot traffic, without attaching a fixed light to the ceiling or standing a lamp on a table. If you rent, they’re a versatile alternative to using the not-very-pleasing overhead lighting that was never your choice. If you have high ceilings, they add intimacy to a furniture grouping and you can move them around at will, along with your furnishings, rather than committing to a fixed light source in the ceiling. The secret is to make no secret of your floor lamp. Let it stand out. Bring it in to the room, not stuck against the wall or in a corner behind a chair. Think of it as part of the furniture arrangement, bringing it out to sit beside furniture, not behind it. You’ll find it’s more rewarding to have a multi-arm floor lamp within the intimacy of a seating arrangement, both to allow people to see it and to allow its most versatile usage. Sure, floor lamps are usually used for spotlighting object or as task or reading lights. By all means use them for this purpose but try not to hide the lamp. The images below are good examples of the careful placement of focal or task light, with the lamp still being used as a decorative object. If the floor lamp’s arms are moveable, position one arm over a side table, another over the shoulder of a chair, another lighting the carpet or flooring nearby. Be aware of head clearances but also use the lamp as an object and try to make it visible from all angles. If it’s got to go into a corner, make sure it’s not completely hidden behind a chair or other furniture. It should be a highlight, not just a light source. Here’s a great arrangement by designer Ginny Macdonald, showing careful placement of a floor lamp and thoughtful repetition of shape and finish with surrounding objects. 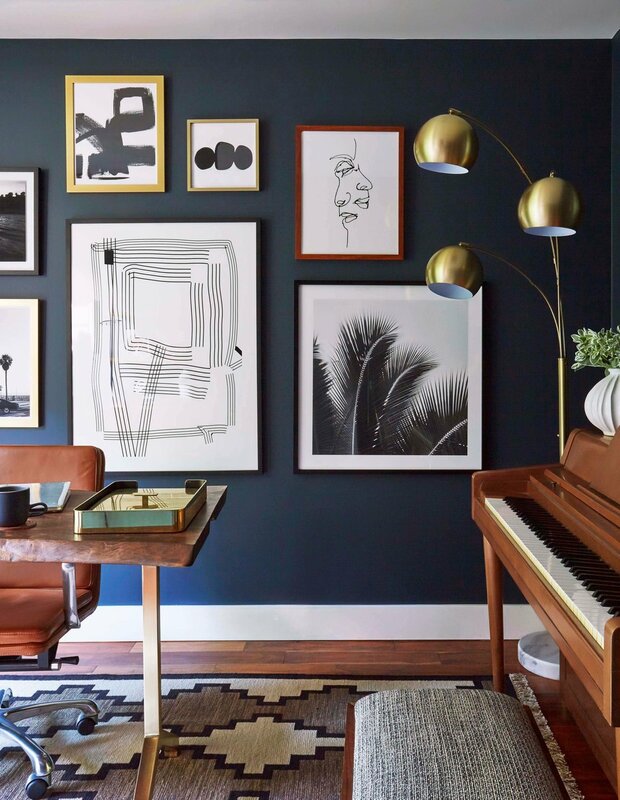 The brass finish of this lamp is picked up in the brass tray and legs of the desk, as well as the gold frames against the dark wall. This use of the lamp is anything but incidental. It’s carefully thought out and even works up a beautiful rhythm of curves with the palm tree in the image beside it. Image courtesy Ginny Macdonald Design. The end of a sofa, table, desk or a piano, as pictured above, is a great place to put a floor lamp. If that side is open to the room, the lamp can punctuate the space, indicating an end to an area of foot traffic and signalling a transition to seated activities. If the side you need to put the lamp is the closed end of the furniture, don’t tuck the lamp too far behind. The takeaway here is whatever your need for the light it provides, don’t hide your floor lamp! It was designed as an object of beauty as well as utility, so let it shine.